"I tried for years to duplicate the crab salad that was made in the seafood market i used to work for, but never could. However, I came up with this one and prefer it a whole lot more. My daughter will hide with the batch I make and eat it all. She doesn't like to share. Serve with club-style crackers." It's really a simple recipe; the only time that is long is the separating of the crab meat. Other then that, it's a quick fix. 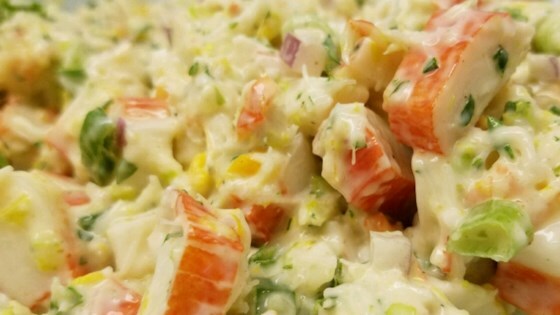 My search for the perfect crab salad is over. I've made this several times and the only thing I've changed is cutting back the mayo to 1/4 cup. Definitely a keeper. Filed under my TNT folder.